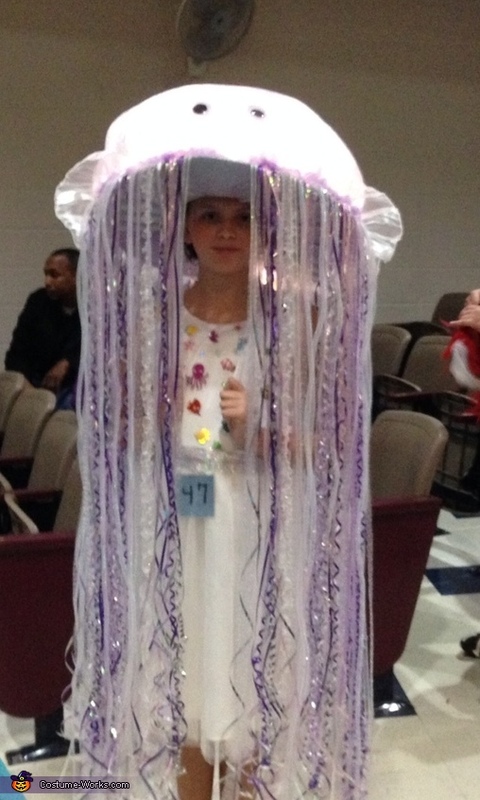 This is my daughter Jessica wearing a homemade jellyfish costume. The idea came from a stuffed beanie baby my daughter fell in love with. To make this We used a hat as the base then we cut a piece of cardboard to make it fit over the hat and tied them together. Then I used fabric to cover the bottom of cardboard I then glued lots and lots and lots of all different types of ribbon to the edges then I used buffalo snow and filling to mold the top round piece. Next I weaved the lighting in and out of the fabric which I had pre cut and last I covered in fabric and the the fabric skirt. All was glued first and stapled for extra support. My daughter wore the wire And battery pack in the back of her dress. This took some time to make but it was a lot of fun and worth it to see my daughters face light up when it was complete.